In the contemporary surgical scenario, there is no consensus amongst practitioners regarding management of Odontogenic infection in Hemophilia patients and proper treatment is not administered often in fear of bleeding. We report successful management of a case of Severe Hemophilia A with buccal space infection based on protocol designed by Ansari MK, et al. for managing space infection in Hemophilia patient. Hemophilia is an X-linked recessive disorder caused by a deficiency in blood coagulation factors. Hemophilia A is characterized by a deficiency of factor VIII (FVIII), whereas hemophilia B is caused by a deficiency of factor IX (FIX). Being an X-linked recessive trait, men typically express the disease, whereas women tend to be asymptomatic carriers. Hemophilia can be classified into Mild (6% to 50% of normal factor VIII activity), Moderate (1% to 5% of Factor VIII activity) and Severe (< 1% of Factor VIII activity). Severe hemophilia is usually associated with Spontaneous bleeding into joints or muscles, predominantly in the absence of identifiable hemostatic challenge . Various protocols are available for performing surgical procedure as well as dental management in Hemophilia patient. However, few articles are available specific to management of odontogenic fascial space abscess in hemophiliac patient . The usual protocol for the management of patients having odontogenic space infection is incision and drainage, removal of the focus and antibiotic along with supportive measures. However, when treating patients with bleeding disorders such as hemophilia, the clinician must pay special attention to treatment planning and consultation with the patient's hematologist as well his physician . These patients may require prophylactic factor VIII infusion prior to any surgical procedure, various adjustments to their treatment perioperative, and special precautions postoperatively. This paper reports successful management of a case with severe hemophilia A (factor VIII level 0.80%) along with buccal space infection associated with decayed mandibular third molar tooth. The author has used the protocol designed by Ansari MK, et al. to successfully manage the patient . A 36-year-old male patient reported to the OPD of Oral and Maxillofacial Surgery with a chief complaint of swelling in left side face for 2-3 days. According to patient he was apparently well 3 days back when he noticed swelling in left side of face which increased rapidly. Patient also had complained of pain in left lower back teeth. There was no history of trauma. No history of fever and discharge from swelling. The patient was a known case of hemophilia A with history of multiple factor VIII transfusions for joint bleeds in lower extremities. On extraoral examination single diffuse swelling was present in left side cheek extending from zygomatic arch superiorly to lower border of mandible inferiorly and antero-posteriorly from left ala of nose to posterior border of ramus of mandible. The swelling was also progressing to left infraorbital region. The overlying skin was tensed, erythematous with raised temperature. Swelling was fluctuant and non-pulsatile. No sinus or any discharge was present (Figure 1). Vision and pupillary reflex were intact. On intraoral examination hematoma was present in left retromolar pad region and adjacent buccal mucosa. The pericoronal flap was inflamed and left mandibular third molar was deeply carious. Mouth opening was slightly restricted. Orthopantomogram (OPG) was advised which showed carious exposed mandibular third molar with periapical pathology (Figure 2). A diagnosis of left buccal space abscess secondary to infected mandibular third molar was made. Treatment was started with systemic antibiotics and analgesic administration according to the protocol designed by Ansari MK, et al. .
A complete blood count (CBC) with differential, prothrombin time (PT), partial thromboplastin time (PTT), platelet count and factor VIII assay were ordered. Abnormal laboratory values included: neutrophil 84%, partial thromboplastin time 38.50 sec, and Factor VIII functional level was 0.80%. Since the patient was a known case of hemophilia A with history of multiple previous factor VIII transfusions, assessment was also done to identify inhibitors to factor VIII which was negative. The patient got slight relief in pain with the use of antibiotic and analgesic for 3 days with improvement in the mouth opening, but still the buccal space swelling was there. So, surgical intervention was planned in hospital setting based on protocol designed by Ansari MK, et al. (Figure 3). Figure 3: Protocol designed by Ansari MK, et al. .
2000 international unit (IU) of antihemophilic factor (AHF) was transfused by the hematologist 1 hour before the planned procedure. Under local anesthesia using 4% articaine infiltration, extraoral incision and drainage was done using Hilton's method for left buccal space abscess and tooth extraction was done with least possible trauma. During drainage, discharge was found to be pus mixed with clotted blood. No drain was placed and extraoral pressure dressing was given. Minimal bleeding was noted during extraction which was controlled by placement of gelfoam and suture with pressure pack. Oral antibiotics and Tramadol with paracetamol were prescribed postoperatively. Extraction site was periodically evaluated for any bleeds. 10 days postoperatively, extraoral swelling reduced markedly and the extraction site showed no bleeding with satisfactory healing. Sutures were removed. The patient was followed up for 1 month, and healing was satisfactory without any complications (Figure 4). Bleeding following surgery is a potential risk in Hemophilia patients. Close cooperation be¬tween hematologists, patient's physician and surgeon is necessary to prevent excessive hemorrhage. Hemophilia is categorized by the degree of clinical factor activity. It is considered to be mild when plasma factor activity is 6%-50%, moderate if it is 1%-5%, and severe if it is less than 1% of normal . In the present case preoperative factor level was found to be less than 1% and was a case of severe Hemophilia A. In severe cases of hemophilia, recurrent bleeding into the joints results in joint deformity and may necessitate joint replacement . The case presented here also had bilateral knee deformity. International guidelines strongly recommend the use of clotting factor replace¬ment therapy for all invasive surgical interventions. The World Federation of Hemophilia (WFH) advises the use of factor concentrates to cryoprecipitate or fresh frozen plasma for the replacement therapy in patients with Hemophilia. Factor VIII concentrates may be divided into two categories, recombinant and plasma-derived factor. There are no statements from the WFH for a preference for recombinant over plasma-derived concentrates. A potential complication of factor VIII replacement therapy is development of antibodies/inhibitors to factor VIII. Antibodies to factor VIII has been found in 8-20% of patients with Hemophilia A [6,7]. Some hemophiliacs who develop inhibitors develop them in low concentrations only. Those with the inhibitor concentration greater than 10 Bethesda unit (BU) is referred to as "high responders" . In the present case although patient had received multiple factor VIII transfusion, but no inhibitor was found. Management of odontogenic infection in hemophilia patients should be done using the combination of systemic and local therapies to counter the bleeding episode. Systemic therapy includes increasing factor levels and inhibiting fibrinolysis. We have successfully treated this patient base on protocol designed by Ansari MK, et al. . We transfused factor VIII preoperatively 1 h before the procedure and measured it after 15 min to assess the desired level. After gaining the adequate factor level, I&D was done. Modifications like avoiding repeated insertions of artery forceps, gentle soft tissue manipulations and using soft rubber drain like gloves were used in this patient. Local measures are an essential component of reducing postoperative bleeding in hemophilic patients presenting for extractions. In addition to pressure, vasoconstrictors in the anesthetic, and an atraumatic approach to surgery, other materials may be applied to the extraction site to arrest bleeding. Topical tranexamic acid can be placed in the extraction socket to aid in hemostasis. Surgical, which is synthetic and provides a framework for clot formation, aids with hemostasis but should be used with caution due to its acidic pH, which can irritate the extraction socket. It is essential for clinicians to have the ability to identify patients with bleeding disorders and know how to best manage them. Invasive dental care procedures for patients with severe hemophilia should be conducted in a specialized setting. These decisions should be made by the clinician, in cooperation with the patient's hematologist, based on the planned procedure and the severity of the patient's disease. Preoperative consultation with the patient's medical provider and/or hematologist is essential, and further laboratory based tests may be needed before treatment is rendered. If odontogenic infection develops in these patients, performing timely incision and drainage using a protocol will minimize the complications and give successful outcome. Patton LL (2003) Bleeding and clotting disorders. In: Burket's oral medicine: Diagnosis and treatment. (10th edn), BC Decker, Hamilton (ON), 454-477. Ansari MK, Hashmi GS, Ahmed SS, Rahman SA, Rahman T (2018) Management of odontogenic fascial space infection in hemophilia patients: A proposed protocol. J Maxillofac Oral Surg. Dalati MH, Kudsi Z, Koussayer LT, Dalati MF, Mawla MF (2012) Bleeding disorders seen in the dental practice. Dent Update 39: 266-268. Schlesinger KW, Ragni MV (2002) Safety of the new generation recombinant factor concentrates. Expert Opin Drug Saf 1: 213-223. 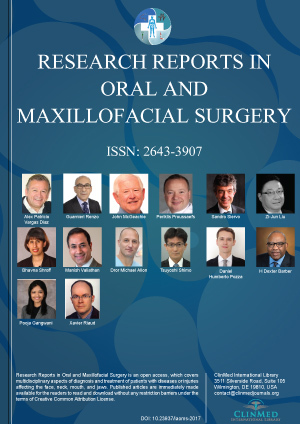 Peisker A, Raschke G, Schultze-Mosgau S (2014) Management of dental extraction in patients with haemophilia A and B: A report of 58 extractions. Med Oral Patol Oral Cir Bucal 19: e55-e60. Rafique S, Fiske J, Palmer G, Daly B (2013) Special care dentistry: Part 1. Dental management of patients with inherited bleeding disorders. Dent Update 40: 613-616, 619-622, 625-626. Shapiro SS, Huntin M (1975) Acquired inhibitors to the blood coagulation factors. Sem Thromb Hemost 1: 336. Sultan Y (1992) Prevalence of inhibitors in a population of 3435 hemophilia patients in France. French Hemophilia Study Group. Thromb Haemost 67: 600-602. Shaikh Amjad, Assistant Professor, Department of Dentistry, Indian Institute of Medical Sciences and Research, Jalna, 431202, India. © 2018 Ansari MK, et al. This is an open-access article distributed under the terms of the Creative Commons Attribution License, which permits unrestricted use, distribution, and reproduction in any medium, provided the original author and source are credited.